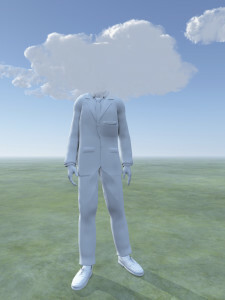 When the words “cloud” and “learning” are mentioned together, I can’t help thinking of “daydreaming”. Not a desirable word association. But, when it comes to learning, having your head in the clouds—cloud-based learning solutions, of course—is just fine. The appeal of shifting to the cloud becomes clearer when considering IT needs. IT departments need to find ways to increase existing capabilities and/or capacity, and unlimited spending is typically not an option. IT costs include, among other items, infrastructure, software licensing, and training. IT decisions involve CapEx vs. OpEx discussions and ensuring that networked information and communications technology (ICT) can deliver ROI. The words that IT professionals use are the same words that Learning & Development (L&D) professionals need to use when deciding on the technology that best supports corporate learning needs. These words include: centrally managed, scalable, redundant, on demand, and mobile. Synchronizing terminology and considering the advantages from both the IT and the L&D perspectives leads to uncovering the full array of advantages of cloud-based learning solutions. Commercial LMS products are typically sold as a locally hosted enterprise product or a Software-as-a-Service (SaaS) offering. The former is hosted on an organization’s own servers. The latter is hosted on the vendor’s servers and is accessible from anywhere because the data is stored “in the cloud”. Centrally managed: The responsibility of deploying system upgrades, freeing up bandwidth, ensuring security, and providing IT support falls on the SaaS vendor. Scalable: No data needs to be stored on an organization’s local servers, so scalability isn’t a concern; most SaaS LMSs are capable of ramping up or down by thousands. Redundant: The SaaS vendor is responsible for initiating and overseeing disaster recovery and contingency plans. On Demand: Cloud-based SaaS products are typically sold as a service (a.k.a., pay as you go). Mobile: Many cloud-based SaaS offerings are accessible from anywhere, on multiple devices. From the IT perspective, cloud-based LMS’s extend the capability and capacity for learning solutions, while managing cost. Reduced Start Up Costs: Initial start up costs can be kept low. There is no software to license or dedicated on-premise server hardware to purchase. No IT or QA personnel are needed to set up and test the cloud-based system. L&D personnel simply sign up for the service. And if the service has embedded authoring capabilities, L&D personnel can immediately create and deploy courses. Faster Deployment: Any delay between service “sign up” and rolling out courses lies within the L&D department, as the time lag solely depends on how quickly courses are created. If the course content has already been designed and developed, the first course can be up and running in an hour or a few. Added IT Personnel: Your IT staff is “in the cloud”. Patches, feature additions, and bug fixes are handled by the vendor’s IT personnel—people who have the specialized skills to manage the cloud-based LMS. People whom you do not need to hire, train, or manage. Data storage, security, and scalability are all handled outside of your organization, allowing your internal personnel to focus on mission critical learning solutions rather than LMS maintenance. From the L&D and from the learner perspective, cloud-based LMS’s lend to easily creating learning solutions with highly desirable learning outcomes. Increased Learner Collaboration: The ability to produce multi-way communication channels in online training increases collaboration and fosters learning discussions. Cloud-based LMS’s can include the ability to integrate with online calendars and email to full conversations on social media sites and tools. Portability: Cloud-based solutions can be accessed via any number of devices (PCs, laptops, phones, tablets, etc.). For the learner, learning can be taken anywhere and when the learner is receptive to learning. The advantage for instructional designers is the same: learning programs can be created anytime and anywhere. And training outcomes are easier to monitor as data and reports can be accessed at the point-of-need, from any location, and easily shared. Learning Embedded in the Daily Workflow: Because of the portability of cloud-based LMS’s, learning can be embedded into the daily work flow (think: Performance Support)—effectively extending learning from the virtual classroom to the job. Increased Productivity: Online training programs can be deployed as fast as they can be imagined and designed. Feedback can be quickly gathered and integrated, and courses can easily be re-deployed. L&D can focus on building great learning solutions while IT doesn’t need to focus on supporting the learning solutions. Increased Reach of Learning Programs: Because of the ability of cloud-based solutions to scale to thousands of learners, to be device agnostic, and to support multiple languages, online training can easily reach a distributed workforce and/or a global workforce. Cloud-based learning solutions provide advantages to the IT department, the L&D department and, most importantly, to the learner. Take advantage of compounded advantages and sync technical and learning-related terminology. By doing so, you’ll ensure that your organization benefits by an increased organizational ability to the support business needs that can be satisfied via learning solutions. What organizational advantages have you found by shifting to cloud-based learning solutions? Gauri Reyes is a talent developer and learning leader with extensive experience in roles ranging from software management to managing the learning function in organizations. She is Principal Learning Strategist and CEO at Triple Point Advisors and Founder of the YOUth LEAD program. Follow her on Twitter, LinkedIn or Google+.